UPDATE 3:30 PM CST: Jerry S. writes: Jean told WZZM 13 News the statue had been returned, taken not by neighbors but by a family member. She declined to explain further, only that this has now become a family situation. Oh, the insanity! 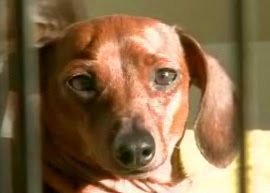 Meet one of Jean Mansel's four dachshunds. Jean lives in Oakbrook Township, Michigan, and says that one of her neighbors took her 80-pound cement Jesus, a family heirloom, and then called to indicate why it was removed. Excerpt from WorldNetDaily: "My husband got a phone call and a real graspy voice over the phone said, 'Check your mailbox,'" she told WZZM-TV. Inside the mailbox was a ransom note. "The note basically said they were holding Jesus for ransom," Mansel said. We are holding Jesus ransom until you clean up the poopie from your wieners and trust us we see you take your wieners for long walks w/out picking up their poopie in our yards. This has upset us dearly so please clean up all the wiener poopie, if you want to see Jesus unharmed. Sincerely, Lindy Lane Residents. Mansel has four wiener dogs and told the station there was a complaint last year about conducting their business on other people's lawns. But she says she's cleaned up every pile since. She says she just wants her statue back, and won't press charges if the cement Jesus isn't harmed. See the video at WZZM-TV. We hope that Mrs. Mansel gets her Jesus statue back, and that things settle down on Lindy Lane. Maybe the street should be renamed 'Shady Lane' because of such shady activities.